This will be the last Women in the Box feature I write for a while as I take time to refuel and explore the television landscape of the past in search of more characters to spotlight (and hey, if you have suggestions let me know either in the comments or on Twitter). 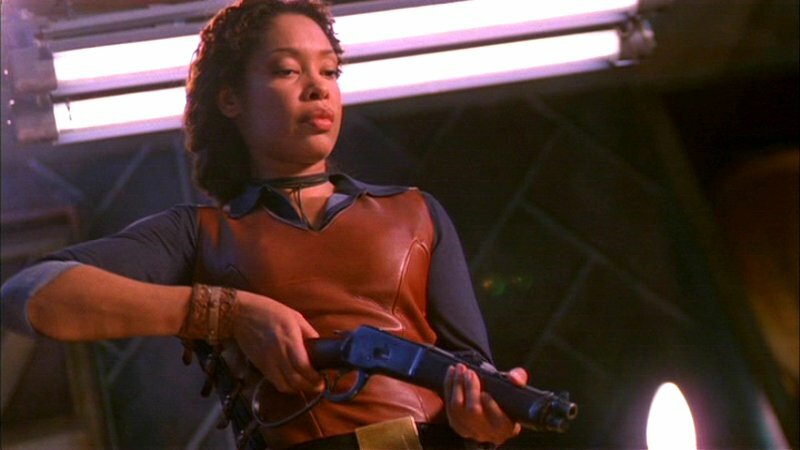 In choosing a final character to spotlight for this phase of the column, I decided to dip once more into the Joss Whedon well and focus on Zoe Washburne, second in command of the good ship Serenity, wife to Wash, and resident warrior woman on the short-lived Fox series/cult classic Firefly (2002). The warrior woman is a well-worn trope in genre television. From Wonder Woman to Xena straight on through to Buffy, they’re women who are competent fighters capable of taking down foes of all shapes, sizes, and genders. They can be (and often are) fetishisized within their fandoms, as the idea of a beautiful woman with power holds a certain allure for the audience. And make no mistake, warrior women within genre fiction are almost exclusively beautiful (Game of Thrones‘ Brienne of Tarth being a welcome exception to the rule). As played by the statuesque beauty Gina Torres, Zoe was stunning and lethal—but she was also married. It was her marriage to Serenity’s pilot Wash (Alan Tudyk), a sweet and geeky man that set Zoe apart from the atypical warrior woman. 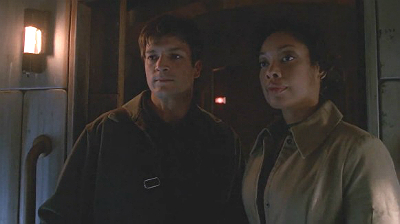 Her stoic character stood in stark contrast to her constantly chattering and quipping husband, as well as her Captain, Malcolm Reynolds (Nathan Fillion). Zoe was presented as a woman with two loyalties: one to her husband and one to her career. At times, these two loyalties would leave her caught in the middle between the man she followed and the man she loved. We know next to nothing about Zoe’s time before Mal and Serenity, but it is established over and over again that her character was forged by the war between The Alliance and the rebels. She addresses Mal as “sir,” throughout the run of the series despite their mutual friendship and affection for one another. Her use of the honorific suggests an inequality in their relationship, an imbalance of power. It’s not a title she offers to any other male member of the crew aside from Mal because their relationships weren’t forged on a battlefield. Even as they lead the lives of outlaws, Zoe is incapable of leaving the rules of war behind her. To some her behavior may suggest subservience, but it’s nothing more than the respect of rank that is ingrained in soldiers and a constant reminder of what makes her tick. Zoe: If I’m going to wear a dress, I’d want something with some slink. In one exchange, Zoe swings from openly embracing her feminine side as she discusses dresses with Kaylee to reminding Jayne of her fighting prowess. It’s a recurring theme with her, she is always strong, confident and possessing a self-assuredness that can easily intimidate if the need arises. However, she’s also a loving wife and her relationship with Wash provides her character with her truest center. She may be a soldier at her core, but love drives her. At one point she and Wash even discuss having a child together, proving that Zoe was not rejecting the typical ideas of femininity even as she filled the more traditionally masculine role in their marriage, acting as a defender for her husband and the rest of the crew. Still, it is worth noting that she takes her husband’s name. It seems even in a futuristic landscape where Mandarin is a common tongue and people live on spaceships, patriarchal traditions remain intact. When Wash goes on a mission with Mal in a form of protest for Mal always leading his wife into danger, the two men find themselves kidnapped by a sadistic man named Niska. Zoe is forced to choose between Mal and Wash, and she doesn’t hesitate before choosing her husband. The choice is partly strategic—as a soldier Mal is better equipped to survive the encounter than a civilian—but it’s also meant to illustrate where Zoe’s priorities lie both to the audience and to Wash. Her loyalty to her Captain runs so deep that she can’t shake his command, but her husband is her partner. By giving Zoe these twin narratives of soldier and wife, Firefly creators Whedon and Tim Minear allowed her to subvert and embody the tropes that come along with each role. While she doesn’t completely rise above the stereotypical idea of the beautiful, deadly warrior woman, Zoe does manage to challenge it by subverting our expectations to be both a gun-toting soldier and a woman in a committed relationship—making this futuristic character all the more real in an age when women can be soldiers, wives and mothers. Sabienna Bowman is a freelance writer and editorial manager at TV Equals. She is also a contributing writer at Film Equals and you can find her previous work at Wit & Fancy. Follow her on Twitter @sljbowman. Excellent piece. I agree with everything except one quibble. I didn’t see her loyalty as being to her career, which she essentially lost when the war ended, but to an individual she had chosen to give it to. It’s just an interpretation thing, but I see “loyalty to a career” as being dedicated to climbing the hierarchical ladder, advancing in whatever field you’re in, and that definitely wasn’t Zoe. I agree with you: if we forget about Wash for a second, I always saw her as loyal to Mal before all, as her friend and someone she could trust and follow, even though she didn’t always agree with him, and then to the Independents. We don’t know why she left, nor why she ended up on Serenity, and I won’t start throwing hypotheses here although I have a few… But this shows that, just like Mal, her role in the war had more to do with the side she fought for than her career. Like you, I don’t think she cared about advancing her career; what I do believe is that doing what she thought was right, and defending civilians, was what motivated her during the war. But then, we never learned why she joined the army, or where she came from. Maybe a soldier’s life was all she knew before she joined Serenity. On another note, I was happy to read this article on Zoe’s “too seldom combined” tropes which reminded me of what makes her one of my favorite warrior women on TV. It’s so heartwarming to see how many people are still watching, re-watching, discussing, and sharing their love for the show and movie!